Any business comes to a point when keeping a list of clients in an Excel file becomes counterproductive. Getting an expensive CRM system, like SalesForce, which costs $60 per user per month is out of the questions. A number of great free opensource CRM systems are available, but this option is limited only to those who have strong coding skills. Otherwise you’d have to pay $50-$100 an hour to an IT guy to set it up properly for you. A free hosted CRM is the only option available. A hosted CRM, as the name implies, is a customer relationship management system that’s being hosted by someone, usually in the cloud. All you have to do is go online, log in and you have access to all your client data. No deployment, no set up, no coding. And advantage of this service being available for free - well, I take it you can figure it out on your own. Companies offer free online CRM not out of their good will. For them it’s a ‘recruiting’ strategy. Every free online CRM has with some sort of limit - either by the number of users, or by the number of contacts you are allowed to have or some critical function being unavailable in the free plan (usually it’s invoices or e-mail integration). Sturgeon’s law (”90% of everything is crap”) certainly applies to hosted CRMs as well. 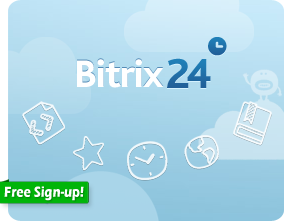 However, there are some vendors who’s free plans are quite generous (may be overly generous as is the case with Bitrix24), so here are three that are in my personal and no doubt biased view are the best free hosted CRM currently available to small business owners. Free users - 12. Number of contacts in free plan - unlimited. Core CRM functions available for free - most or all (access rights, sales funnel, e-mail from CRM (Send’n'Save), click to call and IP telephony integration, workflow (business processes), invoices, sales reports, file shareing, mobile app - free, fully functional Android and iPhone, automatic lead import from your website - yes. Data import/export - yes (csv, Excel, etc). Not available in free edition - quotes, self-hosted version, extended customization. API available - yes. Social CRM - no. Other bonus features - activity stream, task management, working with documents,group calendars, basic HRIS (human resources information system). Free users - 3. Free contacts - 2500. Core CRM funcations available for free - most (address books, customm role fo contacts, milestones, sales pipeline, email tracking, tags, notifications, following). Workflow integration - limited. Massmail - MailChimp integration (paid). Data import/export - yes. Mobile app - free for Android and iPhone, read only. Not available in free edition - customer support, extended custization, social CRM, full API access. Self-hosted version - not available. Other bonus features - file sharing, basic task management. Free users -2. Free contacts - 250. Core CRM functions available for free - most, but no analytics is available in the free editions. Lead management, contact management, access rights, tasks. Mobile app - free Android and iPhone app, almost fully functional. Data import/export - yes. Social CRM - no. Not available in free edition - any analytics. Other bonus features - none really. Do you know of other great free hosted CRM that’s small business friendly and should be included along these three? Make sure you leave a commend with the URL and which free feature you think is worth talking about.